Sarah Ball, wife of John A. Ball, died on 20 October 1904 aged 49 years, 3 months, and 15 days. 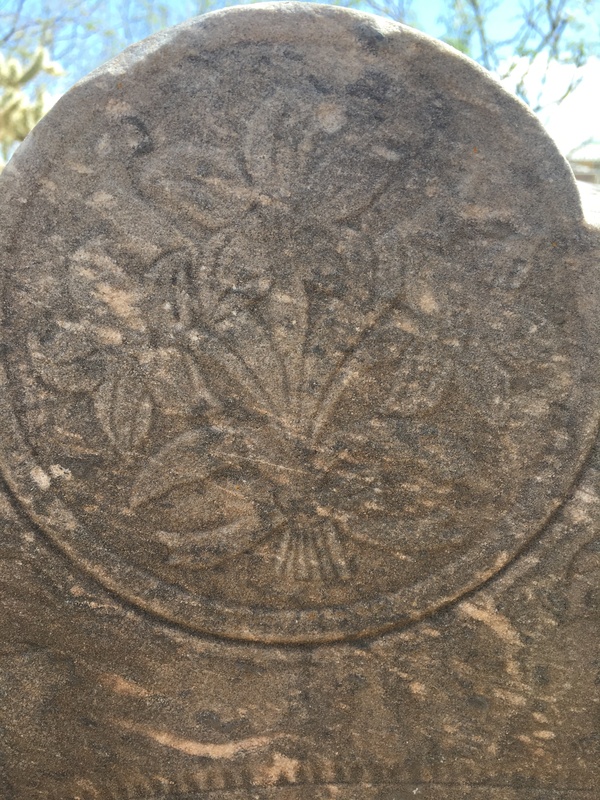 Her tombstone is a simple unpolished, gray marble stone with a elegant round carving of flowers at the top. 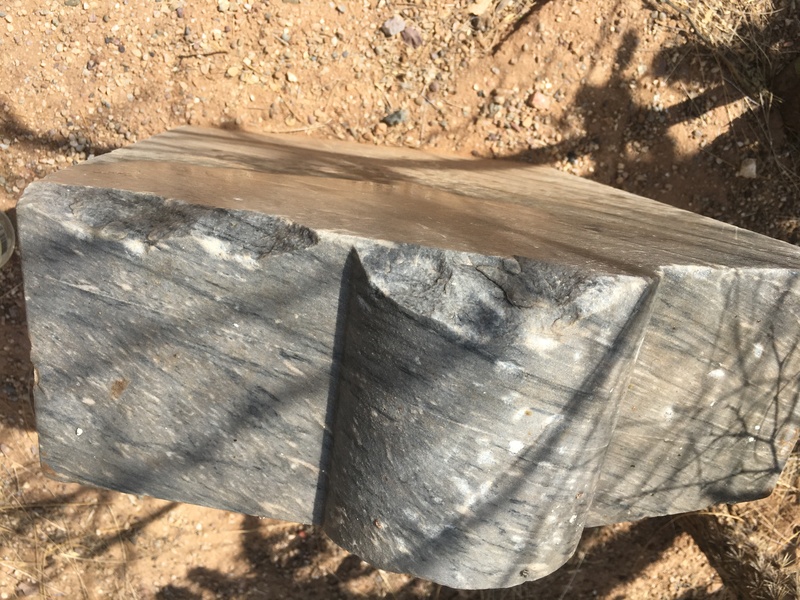 The back of the tombstone has damage with some significant chipping at the top back portion. 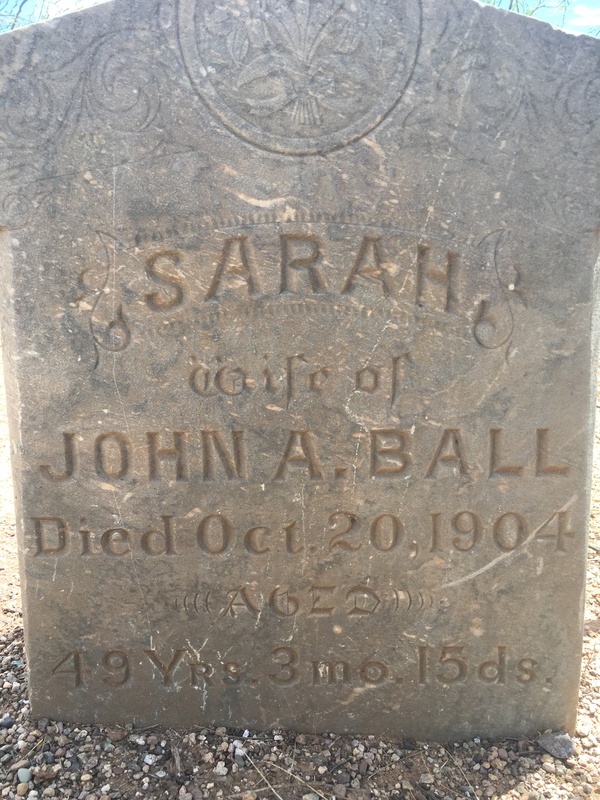 A quick search of Find A Grave yields no results for cemetery pictures for Sarah Ball’s grave marker. With me knowing exactly where the tombstone is right now, this is not an unexpected result. Here is a wider shot of her tombstone. Wait, is that prickly pear and cholla cactus in the picture? How can that be? Sarah is from Tioga County, Pennsylvania, and there’s no cactus like that in that region. Where is the grass and other gravestones from the cemetery? Here is the story as related to me. Sarah died and was buried in a Tioga County cemetery (name unknown) in Pennsylvania. Her family provided her with a beautifully carved headstone. She laid in rest there until the late 1970s. Dam construction in the Tioga County, Pennsylvania, area caused her cemetery (and others) to be moved. The bodies were moved (unconfirmed) but the gravestones did not follow them. The stones were gathered up and piled in great heaps. Eventually, local antique dealers were allowed to come in and purchase the gravestones. My ex-husband Bruce’s mother, Barbara (Gilroy) Shutts, purchased Sarah’s tombstone. She gave the headstone to Bruce who had it at his house for a while in Elmira, New York. 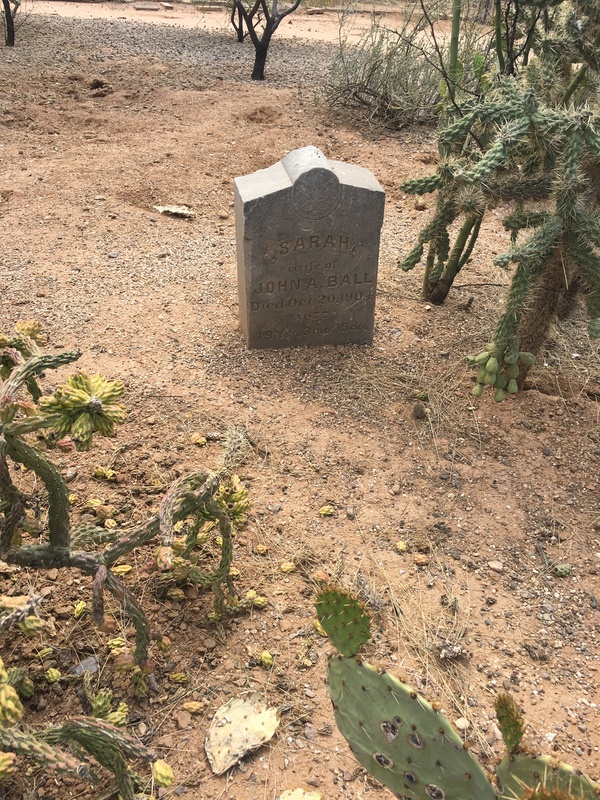 When he moved out here to Tucson around 2000-2001, he brought Sarah’s tombstone with him. After we were married, the tombstone took up residence in our side yard. As if it’s not hard enough to track down the females in our family trees, things like this make locating information on them even harder. There is not clear paper trail tracking the movement of Sarah’s tombstone and she’s definitely not buried where her marker is located. Find A Grave (or the internet) didn’t exist before the cemetery was ruined. A search of Google (tioga county cemeteries affected by dam project) bring up a sprawling website related to Tioga history that I didn’t have the patience to search through diligently to find either Sarah or John A. Ball given that they aren’t in my family. Here’s hoping that someone finds my blog and gets to connect Sarah’s tombstone to their family and add the photo to their files! 1910 U. S. census, Tioga County, Pennsylvania, population schedule, Lawrence Township, ED 141, p. 7B (penned), dwelling 179, family 188, John A. Ball; digital image, Ancestry.com (http://www.ancestry.com : accessed 18 August 2018); citing NARA microfilm publication T623. This entry was posted in 52P52W and tagged ball, cemetery, tioga, tioga county, tombstone. Bookmark the permalink.